Looking for a money savvy community to share and pick up real life ideas for living in these financially pressing times? With money saving websites becoming an everyday source of reference, advice, money counselling, money news and savings/deals, it is becoming apparent that more and more people are coming together to help each other out, much like the wartime spirit of old. Family MoneyBox has been developed with the community spirit in mind. Chock full of tips and tricks to save money, low cost recipes, family excursion ideas, real life guidance to manage your finances and ensure your financial wellbeing, and even some ideas to make money! It also has some really fantastic, simple-to-use tools & calculators to help you with working out the sums. 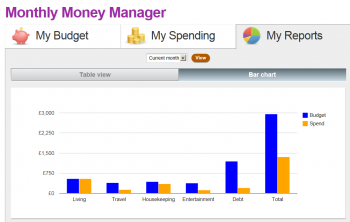 The Monthly Money Manager has a fully customisable budgeting tool which also includes visual representation of your income and expenditure as well as the ability to track your spending month on month. There is a really handy forum to discuss all sorts of finance queries and for building a community. You’ll also find the blog, updated with activities and money savings ideas for all the family to enjoy and discover. Monthly Money Manager – registration is quick, simple and free! Money Calculator – a basic budgeting tool. Got any suggestions for Family MoneyBox? Contact Family MoneyBox directly here. On Pinterest? Family MoneyBox has a Pinterest page. So get pinning!